Carrying 156 passengers and debuting in 2019, AmaMora offers a generous amount of personal space per passenger, surrounded by decor that is modern and remarkably pleasing. 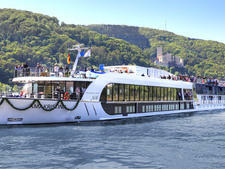 Indeed, AmaWaterways seems to have perfected the design of its ships, with only subtle tweaks present in each successive vessel. If you've sailed with the line before, you'll find a lot to like about AmaMora. 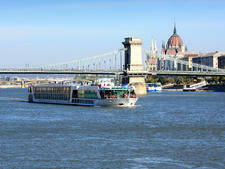 For those who are new to AmaWateways or to river cruising in general, this ship is a great place to start. Onboard amenities include active and wellness features like complimentary onboard bicycles and, new for 2019, an onboard wellness program that provides a dedicated fitness expert and hosted classes. 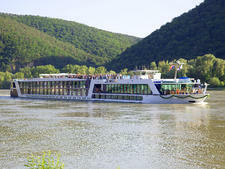 On excursions ashore, passengers can partake in walking tours at several difficulty levels, including a special "gentle walkers" group suitable for those with mobility issues or who simply want to take more time to stop and smell the roses. AmaMora also features an all-day tapas menu, afternoon tea, a 24-hour coffee station positioned in the ship's main lounge and a nightly Happy Hour that includes complimentary alcoholic beverages. 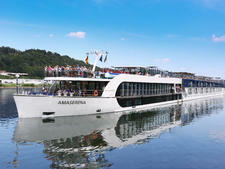 Aboard AmaMora, like other AmaWaterways vessels, beer, wine and soft drinks are inclusive with lunch and dinner. 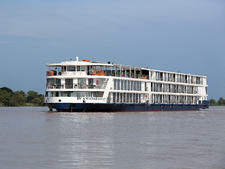 Other niceties that aren't always present on other river cruise ships include an onboard swimming pool with swim-up bar, and a fitness center. The majority of meals are taken in the ship's main restaurant on Cello Deck. Meals are regionally inspired, so expect a healthy dose of European favorites with a slight North American twist. Breakfast, lunch and dinner are open seating, with the latter two including regional beer, wine and soft drinks. Pours, especially for wine, are generous; don't be afraid to place your hand over your glass to indicate if you are done. Meal hours vary depending on the port and the days' activities. Breakfast and lunch are come-as-you-wish affairs, while all passengers typically dine together at a set time each evening. Casual fare can be found in the main lounge, with pastries in the morning and soup and sandwich options at lunch. Snacks are available here throughout the day, complemented by an all-hours tapas menu. Those wanting a special dining experience will want to book the Chef's Table. Situated in its own room at the aft end of Violin Deck, the Chef's Table is available to book at least once per cruise for all guests. This relaxed-pace dining venue is all about the enjoyment of food, so prepare for a pleasurably long meal. 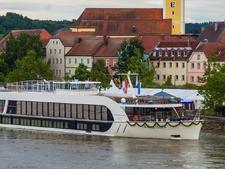 AmaWaterways rotates this menu seasonally, and adjustments can be made for those with dietary restrictions. 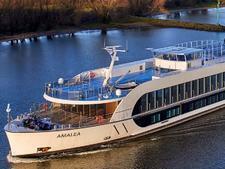 Cabins aboard AmaMora are comfortable and well-designed across all categories. Category D and E cabins are rather stylish river-view numbers that have half-height windows and many of the same amenities as the more expensive categories, for a fraction of the price. Moving up the cabin ladder adds a French balcony (Categories CA and CB). 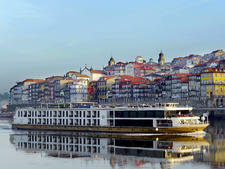 The vast majority of the accommodations aboard AmaMora are AmaWaterways' signature "twin balconies." These cabins feature both French and full step-out balconies in a single room; a great feature for those who have a hard time deciding between the two on other lines. These cabins are tastefully decorated with recessed lighting, plenty of wood accents, an on-demand entertainment center and a spacious bathroom with multijet showerheads. The largest accommodations are four suites that measure 350 square feet apiece. 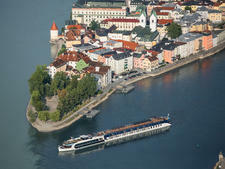 Located forward on Violin Deck, these rooms also feature AmaWaterways' signature twin balcony concept. Suites also have larger-than-average bathrooms with tubs, along with an in-suite iPad and MacBook. 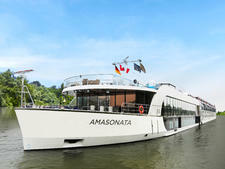 Unlike many river cruise ships, AmaMora features both connecting staterooms and triple-occupancy staterooms. These are great for friends (and families) who want to travel together. AmaMora features complimentary Wi-Fi, and an interactive television center in each cabin can be used to access it for those who don't have their own Wi-Fi enable devices. High atop AmaMora is a jogging track that runs around the perimeter of the ship. This is bordered by a large seating area that offers great views of the passing scenery. 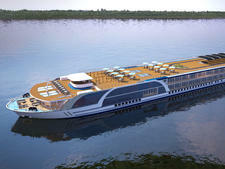 The ship also features a swimming pool with a swim-up bar, with additional seating just forward of that. A nightly piano player entertains guests in the main lounge for pre-and-post dinner cocktails. 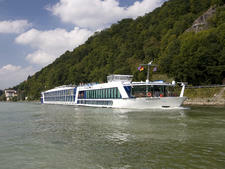 AmaWaterways sometimes brings local performers onboard in select ports of call. Entertainment is mostly social in nature, with guests conversing about the days' activities and other subjects into the late evening. Throughout the voyage, other fun diversions – like cooking classes or holiday-specific events – tend to be held in the ship's main lounge during scenic cruising hours. 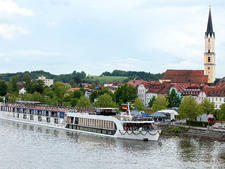 Thanks to its unique partnership with Adventures by Disney and its connecting and triple-occupancy cabins, AmaMora is one of the more family-friendly river cruise ships afloat. 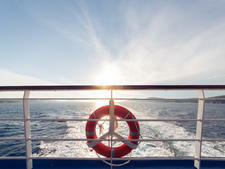 Still, it is a good idea to book a family-specific sailing if you are traveling with kids or teenagers. Few provisions are made for them onboard outside of these special voyages. 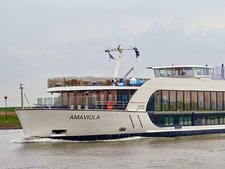 AmaMora will make its home on Europe's Rhine River, where it will sail three basic weeklong itineraries for AmaWaterways. 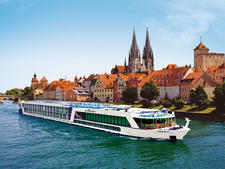 These include the seven-night Enchanting Rhine from Basel to Amsterdam; the seven-night Captivating Rhine from Amsterdam to Basel; and the seven-night Christmas Markets on the Rhine holiday season cruise, traveling from Amsterdam to Basel.